Deep Water And Dock In Place! Bring Your Bathing Suit And Jump Right In! Secluded with Double Slip Dock! Lake Hartwell in the Northeast Georgia Mountains is one of the most popular recreational lakes in the country, and for good reason. With 962 miles of shoreline and almost 56,000 acres of water, this lake offers boundless areas for exploration and enjoyment. 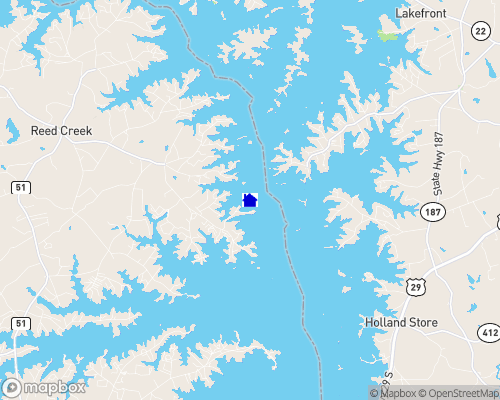 Lake properties for sale on Lake Hartwell provide easy access to the lake, and the many boat ramps and water equipment rental shops around the lake provide the essentials for a day of fun on the water. A local hot spot is Rock Quarry, where you can leap from the rocks into the lake water below. For the fisherman, Lake Hartwell is a perfect destination. This man-made reservoir was created by Hartwell Dam located on the Savannah River, and it is filled with naturally-occurring bream, catfish, small mouth bass, walleye, and large mouth bass. If you're looking for a fishing experience akin to salt-water fishing, try your hand at the striped bass that are regularly restocked. 20-pound striped bass are common, and stripers as heavy as 60 pounds have been caught near the lakefront homes of Lake Hartwell. If fishing isn’t the only sport you love, you'll want to catch a Clemson football game. During football season, boaters on Lake Hartwell travel up the Seneca River to watch the game in the university stadium. And if golf is your sport, Hartwell Golf Club, Cateechee Golf Club, and the Stone Creek Cove Golf Course are just a few of the pristine courses overlooking the beautiful lake scenery. Golf homes for rent are available for many area courses, putting your favorite green right outside your front door. Visit GolfHomes.com for property listings and details. Lake homes for sale have access to more than water recreation and sporting events. Hart County, Georgia borders the lake, offering a variety delicious dining options such as Backstreet BBQ and Dockside Seafood House. Lake Hartwell is bisected by Interstate 85, making daytrips to nearby locales effortless. Downtown Atlanta is only a two-hour drive away. You can listen to the Atlanta Symphony Orchestra under the stars at the Verizon Wireless Amphitheatre in Atlanta, take a class with the LEGO Master Model Builder at LEGOLAND Discovery Center Atlanta, or get your thrill at Six Flags Over Georgia—all within a short drive from your lake-view cabin on Lake Hartwell. Water Level: Average water level variance? 4 ft.
Boat Docks: Are they permitted? YES, FLOATING DOCKS ONLY. Power Boats: Are they permitted? YES, NO LIMITATION ON SIZE. The Tugaloo River and the Seneca river are considered prime fishing areas. Broken Bridge Fishing Pier: US 123 at the GA - SC line. Fishing pier, picnic tables, launch ramp. The "Big Water" area south of I-85 is the best area for sailing and large boats. Tugaloo State Park (Lavonia, GA): From I-85 GA Exit 59, south on 77, right on Knox Bridge Crossing (GA 59), right on 328, then right on Tugaloo State Park Road. Camping, cottages, picnic tables, playground, launch ramp, sandy swim beach, miniature golf, tennis, volleyball, horseshoes, nature trails, and special events. (706)356-4362. Lake Hartwell State Park (Fair Play, SC): From I-85 SC Exit 1, north 1 mile on SC Hwy 11. Camping, launch ramp, picnic tables, playground, store, nature trail. (864)972-3352. Hart State Park (330 Hart State Park Rd. Hartwell, GA): Camping, cottages, playground, beach, picnic area. (706)376-8756. Sadlers Creek State Park (Anderson, SC): Off SC-187, 13 miles SW of Anderson. Camping, picnic area, playground, nature trails. (864)226-8950. MOUNTAINS and NATIONAL FORESTS totaling 2 million acres are located within an hour. These areas feature hundreds of hiking trails, mountain trout streams, waterfalls, horseback riding, whitewater rafting, canoeing, rock climbing, mountain biking, scenic drives, bicycling, gem mining, and dozens of beautiful picnic areas. SHOP unique area markets or explore giant flea markets, factory outlet stores, and unique craft shops scattered throughout the area. Or try your luck at one of the nearby Cash BINGO halls or video CASINOS. The surrounding 6 counties are home to 2 national forests, 10 state parks, and hundreds of waterfalls and trails. Clemson University draws hundreds of thousands each year to sporting events. The National Wild and Scenic Chattooga River is one of the most popular whitewater rafting rivers in the country. Add it all up and the Lake Hartwell area is one of the busiest tourist areas in the country with people coming from every state in the nation and many foreign countries.